Kmart was Bismarck’s second modern-day discount department store when it opened in October 1971 (after Northbrook’s much smaller Tempo in 1963). Originally referred to as “Kmart Shopping Center,” the building consisted of the 84,000-square-foot namesake department store and a 20,000-square-foot National Food Store store operated by National Tea (named Kmart Foods until 1974). Dan’s Supervalu later occupies the grocery store until building its own store across the street in 1980. Kmart eventually expands into the space, consuming the entire building. The store was renovated in 1991. It was one of the first Kmarts modeled after a new prototype first implemented in Oak Park, Michigan. The renovation introduced a new logo, wider aisles, and improved lighting. The previously-separate deli and restaurant were combined and relocated to the front. The store’s selling area was also expanded into existing storage space to expand such growing departments as clothing, electronics, and pets. A smaller remodel also came in 1999 upon taking on the Big K format. Kmart is one of the first businesses to open north of I-94 along the State Street Corridor and was an early driving force in nearby commercial development. 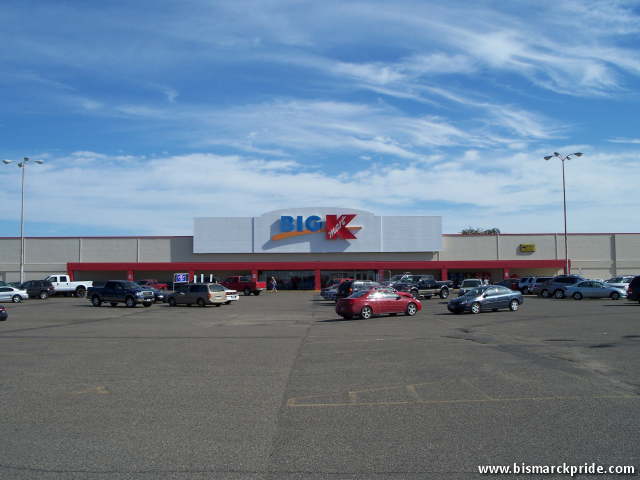 Bismarck’s Kmart was one of the last to shutter its K Cafe. The north side of Bismarck’s Kmart originally housed a grocery story, National Food Store (AKA National Tea Company), which later became Dan’s Supervalu until 1980. That space has since been overtaken by Kmart. Near Wells Fargo and KFYR-TV. An upscale furniture and interior decor store located at 26th & Rosser.